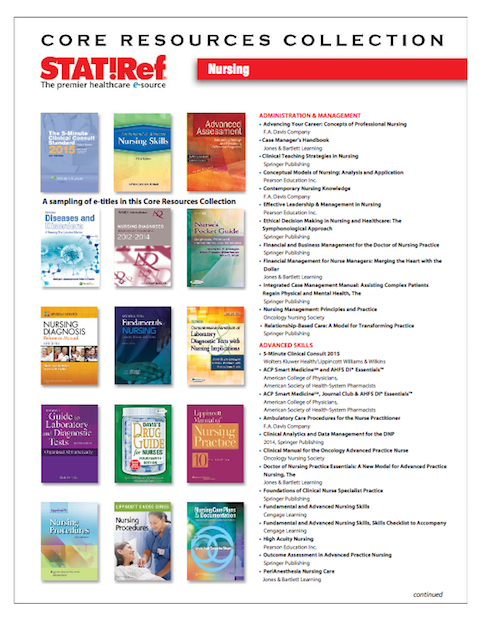 Offering the most comprehensive online nursing collection of 165+ nursing resources in 70 Nursing specialties STAT!Ref Nursing Resources should be your go-to online resource. With numerous titles in various specialties we cover all aspects of the nursing profession. Whether you are looking for resources in a specific nursing occupation, board certification, or are focused more on evidence-based nursing resources you will find it all here in one easy to use location. For a full list of the STAT!Ref Core Resources Collection for Nursing, download the handout below or click here. Every subscription also comes with an integrated free dictionary. You can select from Stedman's Medical Dictionary or Taber's® Cyclopedic Medical Dictionary to compliment your nursing subscription. And, don't forget the new and comprehensive medical question bank product from STAT!Ref called BoardVitals. BoardVitals offers high-quality NCLEX RN, NCLEX PN and Family Nurse Practitioner exam review questions in an interactive online database. Download the BoardVitals Nursing Handout to learn more about these exam products or click here to watch an informative video about BoardVItals. For more information about these resources, or to schedule a demonstration webinar or free trial, contact a STAT!Ref Team Member here or by calling 800-901-5494. Previous Have You Seen the STAT!Ref Help Page?